As German shepherd breeders in NC, we are proud of this litter of German shepherd puppies, born in August, 2010. These German shepherd pups were a result of a breeding between Alan Schrom and Orsina z Get Pet. We invite you to submit a deposit on a German shepherd puppy from any of our future litters of German shepherd puppies for sale in North Carolina. See details on how your deposit will be processed on our Guarantee page. Your deposit is totally refundable should your circumstances change and you no longer wish to buy our German shepherd puppy for sale. Your deposit puts you on our priority waiting list, according to the date when we received your deposit. You will be offered a German shepherd puppy from the first available litter of German shepherd puppies for sale in North Carolina. If you do not choose to get a German shepherd puppy for sale from the litter currently available, your deposit may be refunded or you can choose to retain your position on the priority waiting list and apply the deposit to a future litter. As German shepherd breeders we assure our German shepherd puppies for sale in NC are raised in our home, and played with daily. Each of our puppy German shepherd are crate trained by 8 weeks of age, and have played with balls, tugs and other toys, starting at 4 weeks of age. 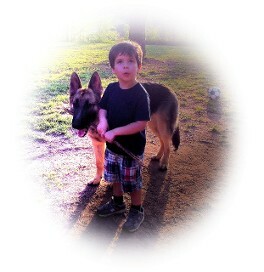 This heightens each German shepherd pups drive, willingness to learn and learning curve. As ethical German shepherd breeders in NC we use only the best Slovakian imported German shepherd stud dogs and german shepherd females we can acquire. We directly import our Czech breeding dogs from Slovakia. Depending on the mother of the puppies, you can expect that Vomweiland, German shepherd breeders in North Carolina can provide black and tan, bicolor black and tan or black German shepherd pups. We do not charge extra for a black German shepherd puppy as many German shepherd breeders choose to do. Your German shepherd pup will have his nails trimmed regularly, and be quite used to having his nails trimmed with a Dremel. Your German shepherd will allow his nails to be trimmed. It costs around $425. to ship a 8-9 week old German shepherd to anywhere in continental U.S.A., including the crate, bowls and required vet health certificate. (Price varies as the cost of the crate, etc. vary). Click to see photos and videos of Chico VomWeiland. We had trained him while he waited to have the necessary immunities to be able to qualify to go to Hawaii. He illustrates the training that can be achieved by 7 months of age if you are consistent.